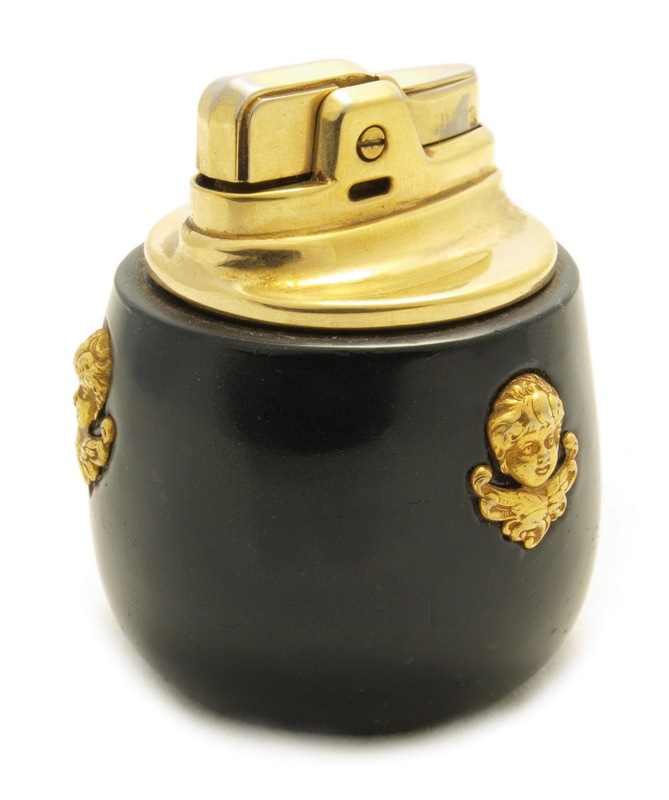 This wick table lighter was made in 1954 in England by Ronson and Wedgwood. Wedgwood is a British pottery firm, founded on May 1, 1759 by Josiah Wedgwood (1730–95). The company still exists and is noted for its numerous innovations and high-quality wares that achieved renown throughout the world. Wedgwood's name is synonymous with the Jasper Ware body type. The main themes on the company's jasper ware have all been taken from ancient mythologies: Roman, Greek or Egyptian. The initial decision to have antique designs was probably that as Britain entered an age of great industrialization, the demand for luxurious goods subsequently exploded. Meanwhile, the archeological fever caught the imagination of many artists. Nothing could have been more suitable to satisfy this huge business demand than to produce replicas of artefacts. Wedgwoods pottery is very collectibles nowadays. The Ronson Royalty Wedgwood was available in chrome plated fitment which was based on a face-lifted Ronson Rondelight. 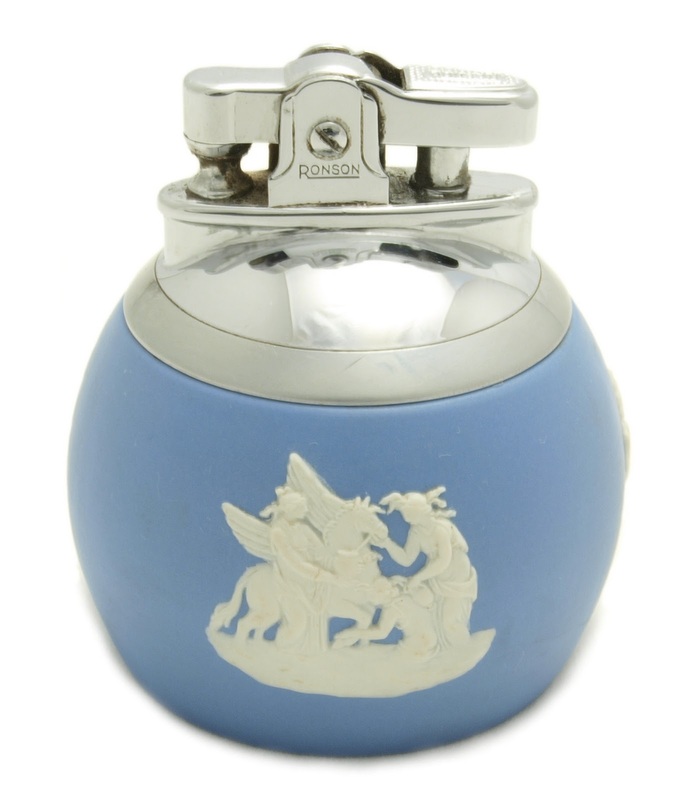 The lighter insert is mounted in Blue Jasper base made by Wedgwood with overlaid design – three different mythological scenes – in white ceramic. The lighter base is padded with light blue felt. The Ronson Royalty was also sold with a matching ashtray. This Ronson magazine advertisement was published in 1949 in Life Magazine. It shows among others the Ronson Crown Set, Ronson Georgian, Ronson Newport and the Ronson Decanter. This ceramic Royal Doulton "The Poacher" Table Lighter was designed by M. Henk and issued between 1958 and 1973 in England. 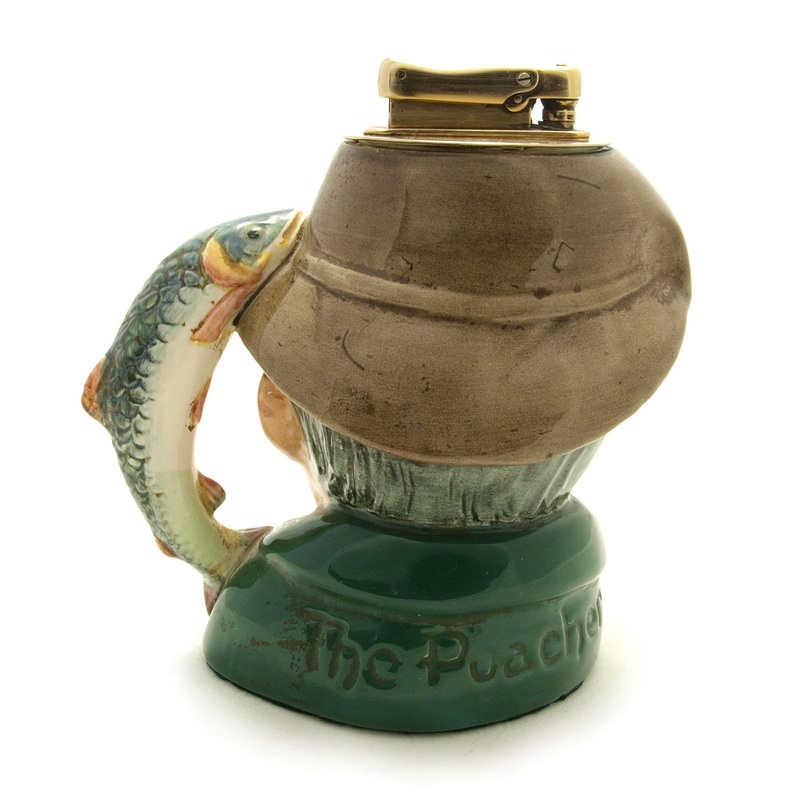 It is a fine example of the great variety of character jugs/table lighters manufactured exclusively by Royal Doulton Company which is an English company producing tableware and collectables, dating to 1815. Operating originally in London, its reputation grew in The Potteries, where it was a latecomer compared to Spode, Wedgwood and Minton. The Royal Doulton Company began as a partnership between John Doulton, Martha Jones, and John Watts, with a factory at Vauxhall Walk, Lambeth, London. The company took the name Doulton in 1853. 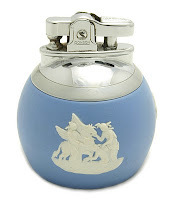 Other character Royal Doulton table lighters are in the shape of: Bacchus, Beafeater, Buz Fuz, Cap'n Cuttle, Captain Ahab, Falstaff, Lawyer, Long Jhon Silver, Mr Micawber, Mr Pickwick, Old Charley, Poacher Porthos, Rip Van Winkle. It is worth to know that poachers are a family (Agonidae) of small bottom-dwelling cold-water marine fish. They are also known as alligatorfishes, starsnouts, hooknoses, and rockheads. This heavy silver plate Ronson table lighter was first manufactured in 1936 in Newark, New Jersey, USA. The production ceased short before the outbreak of the Second World War. 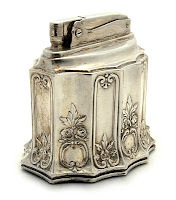 This wick lighter looks very stately and proud - definitely one of my favorite Ronson lighters. The body of the lighter is made of die cast "white metal" and heavy silver-plated. It weights a substantial 385 grams. Decorated in a delicate colonial style and floral patterns. 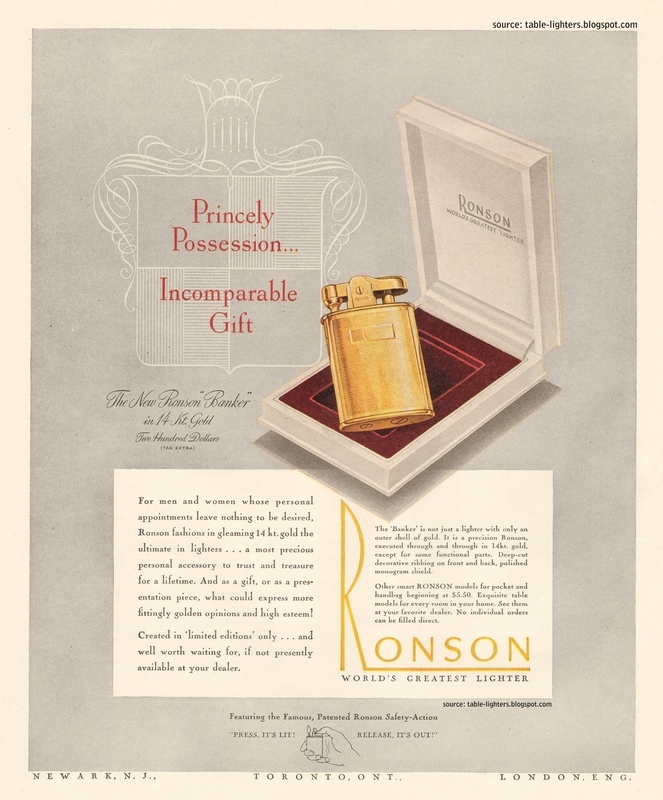 The Ronson Colonial uses the standard Adonis lighter insert. The base has a green felt pad and the silver plate is protected by a transparent lacquer which often is deteriorated and has to be washed up. This Ronson magazine advertisement was published in 1961 in Life Magazine. It shows the rather unsuccessful series of the Pioneer pocket and table lighters manufactured in the USA since 1960. 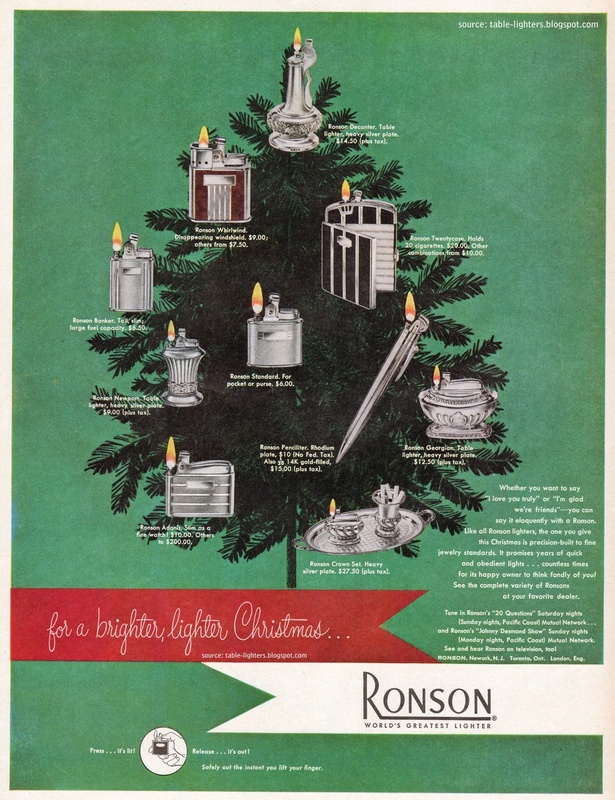 This lovely Ronson magazine advertisement was published in 1947 (exact date and magazine unknown). It shows the pocket cigarette lighter Ronson "Banker" in 14 kt. gold. Great simplistic lay-out in late art deco style. This small but relatively heavy Ronson table lighter was first manufactured in 1956 in Newark, New Jersey, USA and the production ceased just two years later. It was available in two versions: black and white enamel both having the gold tone removable Essex lighter insert and three gold colored cupid plaques. 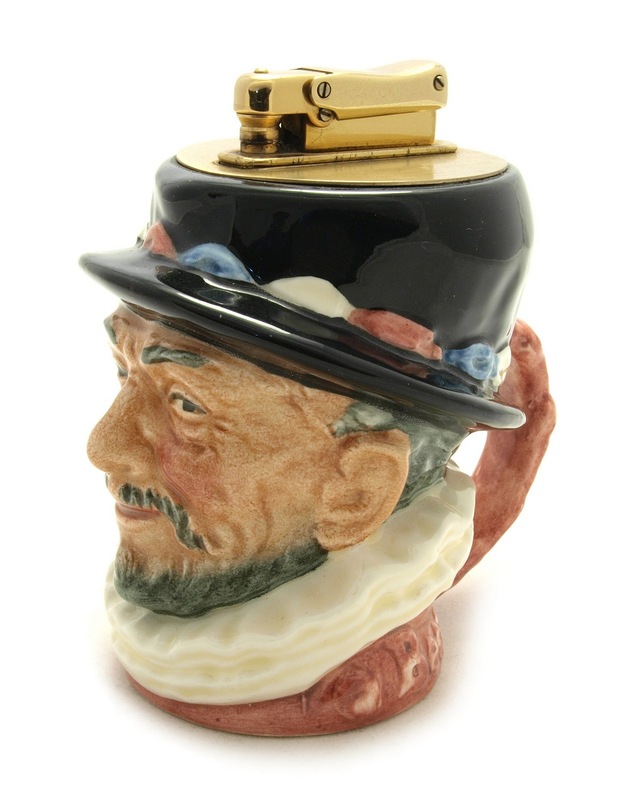 This ceramic Royal Doulton Beefeater Table Lighter was designed by H. Fenton and issued between 1958 and 1973 in England. 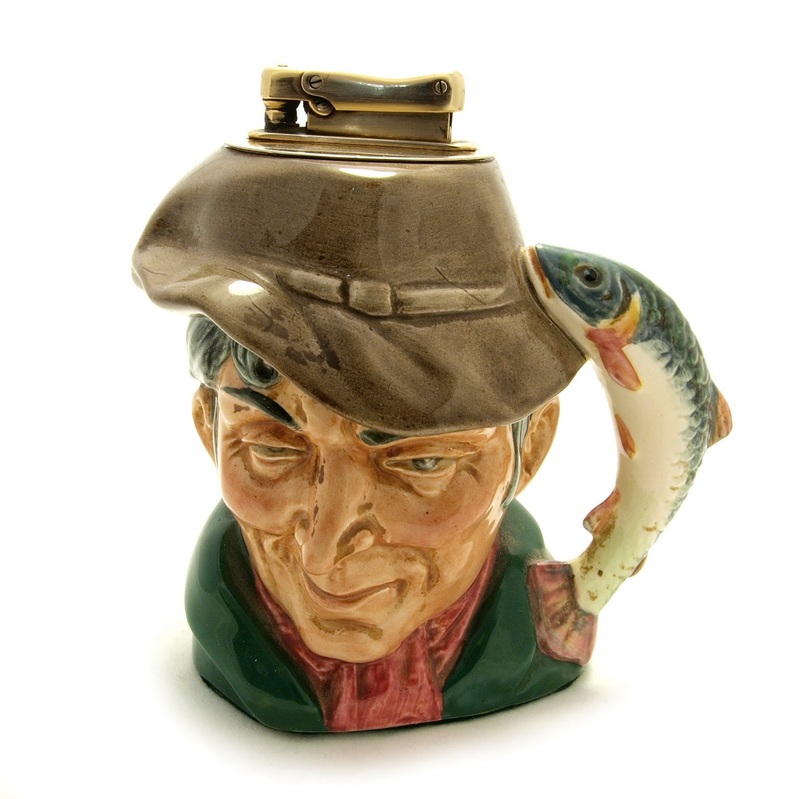 It is a fine example of the great variety of character jugs/table lighters manufactured exclusively by Royal Doulton Company which is an English company producing tableware and collectables, dating to 1815. Operating originally in London, its reputation grew in The Potteries, where it was a latecomer compared to Spode, Wedgwood and Minton. The Royal Doulton Company began as a partnership between John Doulton, Martha Jones, and John Watts, with a factory at Vauxhall Walk, Lambeth, London. The company took the name Doulton in 1853. Other character Royal Doulton table lighters are in the shape of: Bacchus, Buz Fuz, Cap'n Cuttle, Captain Ahab, Falstaff, Lawyer, Long Jhon Silver, Mr Micawber, Mr Pickwick, Old Charley, Poacher Porthos, Rip Van Winkle. It is worth to know that Beefeaters are ceremonial guardians of the Tower of London. In principle they are responsible for looking after any prisoners at the Tower and safeguarding the British crown jewels, but in practice they act as tour guides and are a tourist attraction in their own right, a point the Yeoman Warders acknowledge.